All events will take place at Highline College 2400 S 240th St, Des Moines, WA 98198, with the exception of the Saturday night closing reception, which will be held at the Filipino American Community of Puget Sound, 103 6th Ave N, Algona, Washington 98001. These events are approximately 20-30 miles south of Seattle proper. The main space for the Lao American Writers Summit will be taking place in Building #8, with the majority of workshops in Building #22. Signs will be posted near the parking lots to assist with traffic. 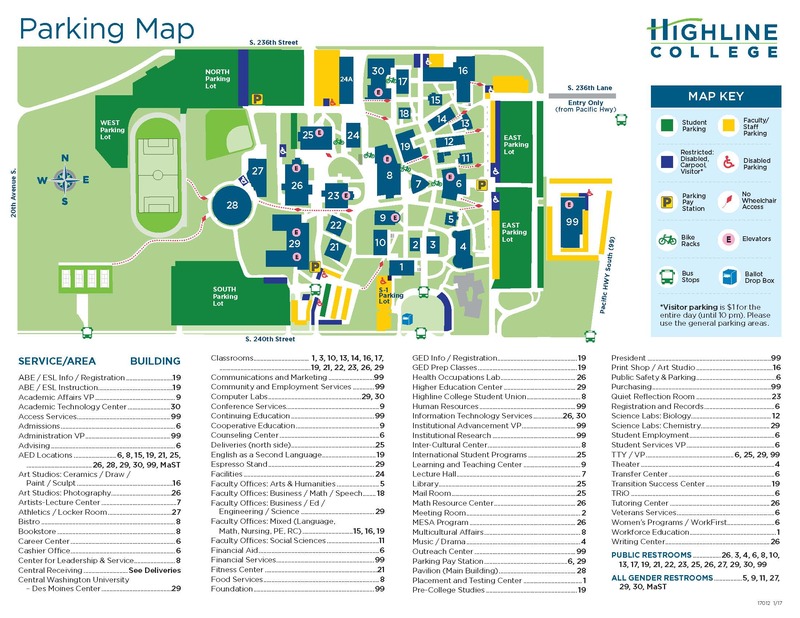 It is highly recommended that all guests who will be driving to Highline College and need to park on campus, to use this Visitor Parking Pass. Please make sure to PRINT and PLACE the permit in a CLEAR and VISIBLE location on their vehicle’s dashboard. ** For additional information or any questions you may have please contact the Public Safety Office at Highline College at (206) 592-3218. Seatac International Airport is the closest airport to the event. Most nearby hotels will have free airport shuttle services. From your hotel, you will have to most likely take a lyft, uber, or taxi to Highline College and Algona for the closing ceremony. The Link light rail is a really cool way to visit Seattle proper once the summit is over. The closest link light rail station from Highline College is the Angle Lake Station, about 3 miles south. There is also a Seatac/Airport Station right outside the airport terminal. For around five dollars round trip, you can easily take a 40 min. scenic light rail trip from the airport to visit Seattle proper. Take the link light rail from Seatac Airport to International District/Chinatown Station. Check out the International District, most notably the Wing Luke Asian Museum and Panama Teahouse, for a bit of NW Asian American history and culture. Walk west towards the water to Pioneer Square, home to many art galleries, including Seattle Lao community favorite ArtXChange Gallery, where the Legacies of War travelling exhibition was first displayed. Walk north from Pioneer Square towards Pike Place Market. Make a stop on the 17th floor of the Russell Investment Building public deck park for a free view of the waterfront and Olympic Mountains, and Mt. Rainier. Good place for a bathroom break too. Get your touristy freak on at Pike Place Market, home of the first Starbucks and fish throwing guys, etc. From Pike Place Market, you can go east for boat rides (#6), or west towards the Space Needle (#7). Boat Rides: from Pike Place, head towards the waterfront for a ferry boat ride to Bainbridge Island, or take the passenger ferry (Water Taxi) to West Seattle. Space Needle: head west from Pike Place Market to Westlake Center to take the Monorail to the Space Noodle (local slang) and Seattle Center. Head back downtown towards any link light rail station back to the airport.